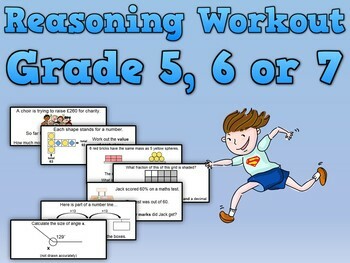 1000s of reasoning questions for Grade 5, 6 and 7 at your fingertips! The spreadsheet has 15 individual reasoning workouts (79 questions in total) that can be randomised to give you an unlimited number of combinations. This means they can be used over and over again throughout the year. A great way of getting pupils to practise their reasoning skills, aid with retention and prepare for tests.